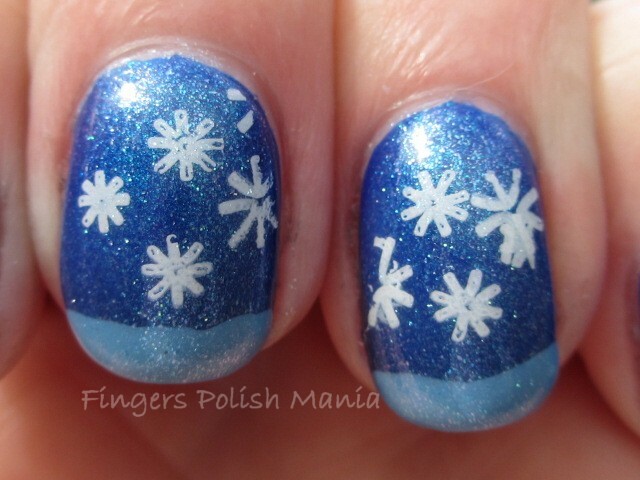 fingers polish mania: Snow in Southtown? Today's post is for two reasons. 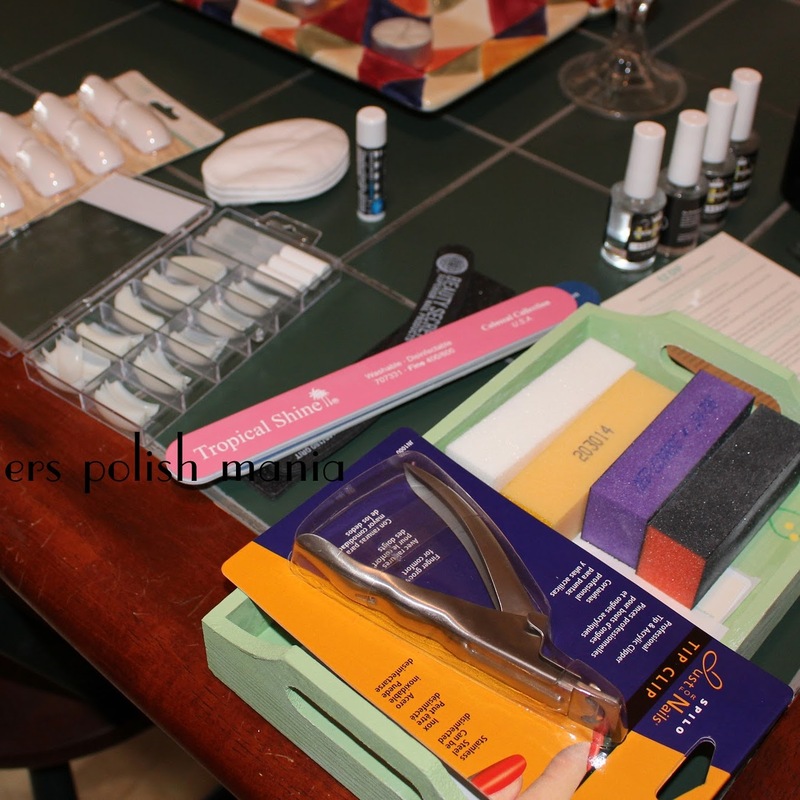 First, I am reviewing a plate from Online Nail Bar and I got a new camera! I haven't figured out quite yet how to work the camera so most of the pictures are blurry on the edges. It's crisp and clear in the center-but outside edges not so much! 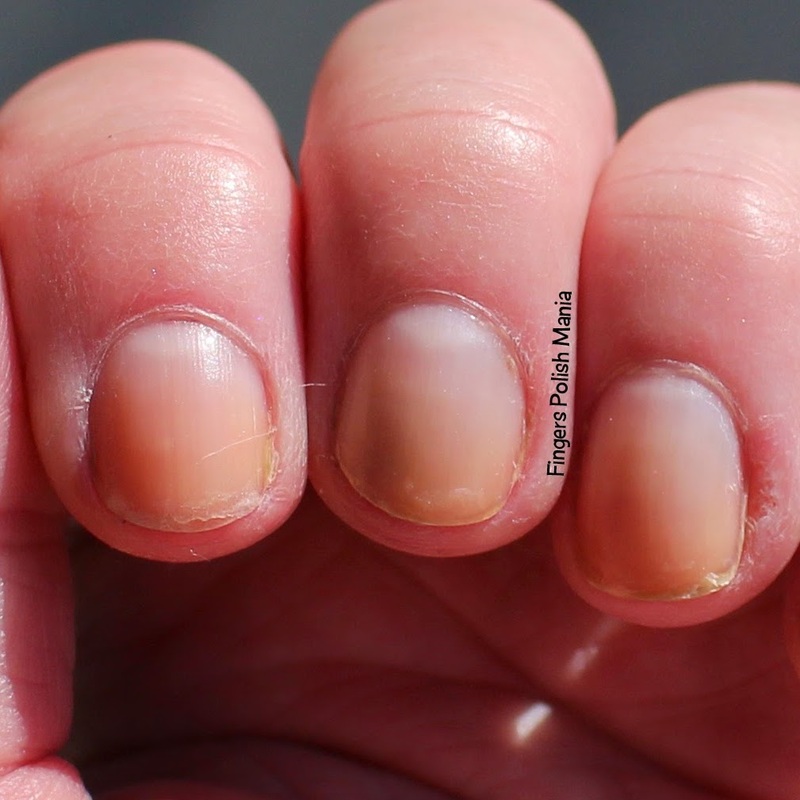 I was asked by Carrie at Online Nail Bar to review her plates. I am always looking for new plates so of course I said yes! 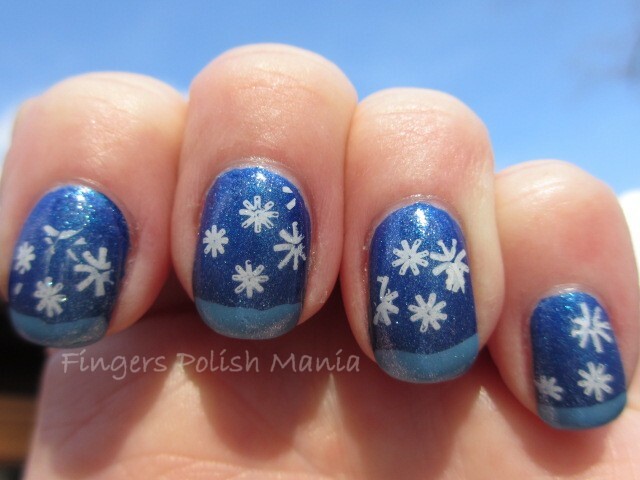 The weather was also calling for snow the day I did this post, so I thought I'd do a winter mani. It hasn't snowed at all in Virginia this winter. So I was looking forward to seeing some snow! First up, the silly bottle shot with my new camera. This is Girly Bits Cosmic Ocean, Essie Coat Azure, Orly Royal Navy and Girly Bits January Morning. Yes I continue on with my addiction to Girly Bits polish! I started with Orly Royal Navy. I had swapped with my bestie Iris at Polish Amor and asked her to get me this one. When it arrived in the mail, I had deja vu. Turns out I already own it!!! 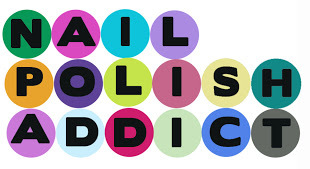 We had a good laugh about that saying only a polish hoarder forgets what she has! I decided I'd better use it so I'd remember I owned it! Royal Navy is a stunning blue with blue shimmer. It's really pretty. The sun was hiding and I'm learning my new camera so cut me some slack ok? Here are your shots. Isn't this a stunning blue?? I just love it! 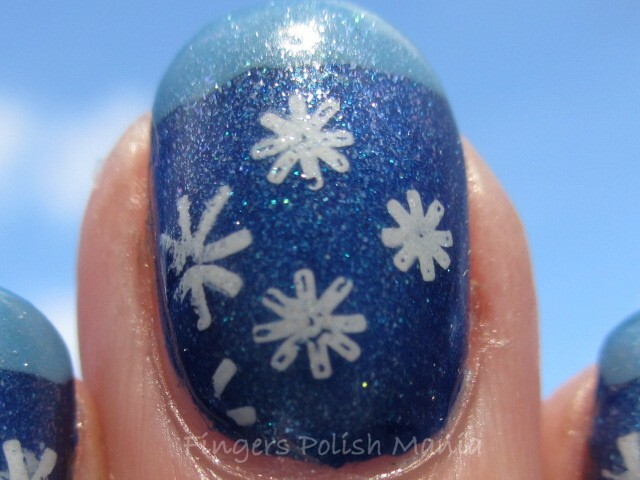 I then took Sally Hansen Whirlwind White and stamped snowflakes with M5 that was given to me for review. I then did a layer of Girly Bits Cosmic Ocean, my funky french with the Essie Coat Azure and then topped it all off with a layer of Girly Bits January Morning. Are you ready for something special? Here it is! Literally thirty minutes after I snapped these sun shots, the sky went black, the winds blew and it started snowing!! Of course, it lasted about an hour and didn't stick but it was still pretty! Don't you just love the sparkle on this? The plate worked just fine. I had absolutely no problems with it. 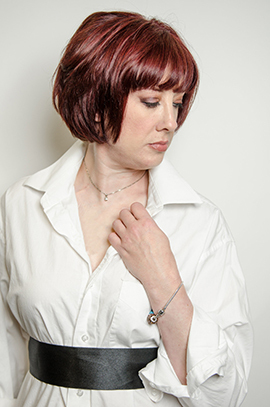 They sell very reasonably on her website. It's in the UK, but she ships internationally. Go check out her site, she also has polish and rhinestones etc! She's trying to talk me into doing a YouTube stamping tutorial video. What do you guys think? Should I do it? 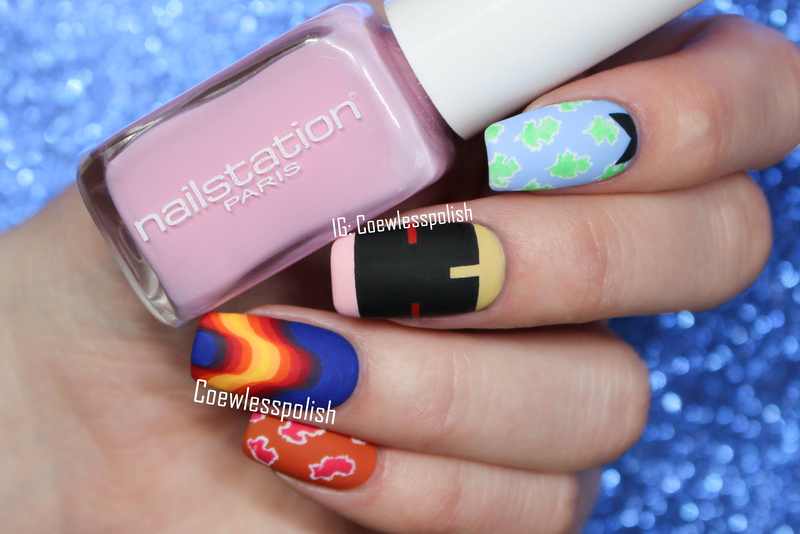 Regardless, this mani is so pretty. The sparkle is like snow flakes glistening on my nails. I just love it! In case any of you were wondering-the title is from my favorite Christmas cartoon, "The Year Without A Santa Claus." So people, are my pictures better with this camera? Can you even tell the difference? I'm still learning so hopefully the next post won't be as blurry around the edges!